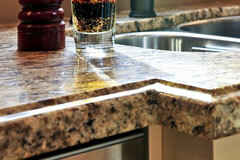 Granite is an excellent counter top material, and it is enormously popular for use in today's kitchens. 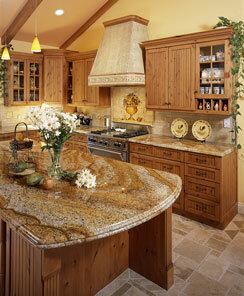 Granite counter tops will work with virtually any style or color cabinet you choose. Whether installed as a slab or as tiles, granite is elegant and durable. Each piece of granite used for your counter top is unique in texture and veining, and it can enhance your kitchen like a piece of fine art. Granite is a beautiful, quarried stone composed of quartz, mica, feldspar, and other minerals that give it a crystalline appearance and feel. It is available in a wide spectrum of colors, ranging from green, gold, and brown to mauve, black, and white. Some kinds of granite are chosen specifically for their veining. Because each piece of granite has different vein characteristics, you should hand-select the pieces you want for your counter tops. In selecting your granite, consider whether the counter tops should be a kitchen focal point or blend with the cabinetry. The granite suppliers listed in this directory can help you find just the right granite pieces for your project. 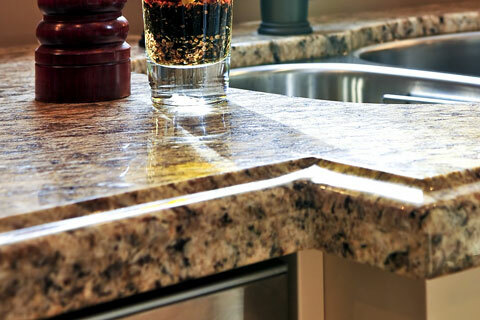 Granite is available with polished, honed, brushed, or flamed surface finishes. A polished, glossy finish brings out the full character and color of the stone while a honed, satin finish has little gloss. A brushed granite finish is created with a coarse wire brush, while a flamed, thermal finish is roughened by intense heat to expose the actual stone grains. Granite is a hard, long-lasting, counter top material which resists scratches, cuts, and scorching heat, but it should be sealed to avoid stains. However, even with all its excellent performance features, remember that granite is a stone surface. A glass or a china plate dropped on granite will break. 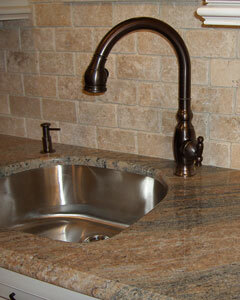 Choose a qualified counter top company to supply, fabricate, and install your granite counter tops. A professional can help you select the right color and pattern for your decor and help you choose complementary backsplash and sink styles. Your fabricator can also provide you with the edge profile you desire, and finish the surface to bring out its unique characteristics. Make sure your cabinets will support this heavy, stone surface, and remember that seams will be visible where the pieces of granite join. Clean granite counter surfaces with mild detergent and water, or use a cleaning product designed for stone counter tops. Don't allow acidic juices or foods to remain on the granite surface. 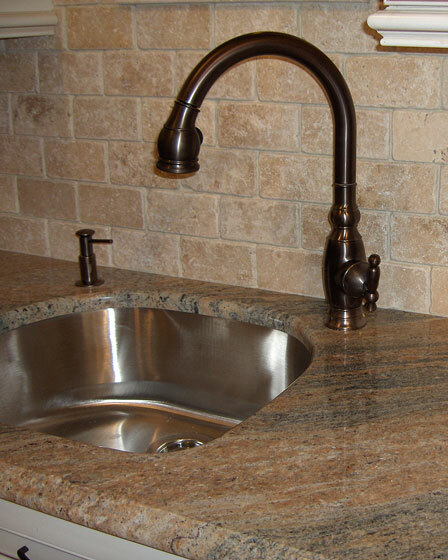 While granite is frequently used for kitchen counters, it is also used in homes, offices, and buildings for bathroom surfaces, flooring, and walls. Granite has been used for many years on building exteriors due to its resistance to weather damage. The following suppliers, fabricators, and installers can help you achieve the elegance you're looking for. Browse through their websites to learn about granite, get helpful advice about its care, and see the color and pattern selections that are currently available. You will be amazed at the many choices and variations that exist for this luxurious counter top material. Artelye, a family-owned business, is a leading granite supplier, fabricator, and installer in the Maryland and Virginia area. View their stone gallery online. This Arizona-based granite supplier and installer can provide kitchen counter tops and bathroom vanity counters, as well as granite sinks and granite surface tables. This granite counter top brand is protected by a permanent sealer. It is available at Home Depot stores nationwide. This granite quarrier and fabricator supplies granite products such as countertop slabs, building cladding, and building interiors.